July | 2012 | Fear the Nerf Bat of Smiting! the constant incessant lies he tells himself. The ego is not a source of strength. It is weakness in disguise. Inside there is invincible strength. and the inner power will shine through. brave knight or a devious thief? 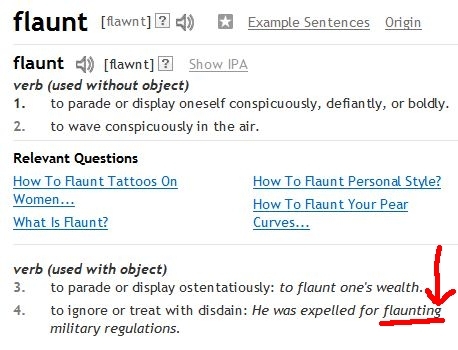 “Flaunt” and “Flout” are NOT the same thing – I’m pointing at you, dictionary.com! 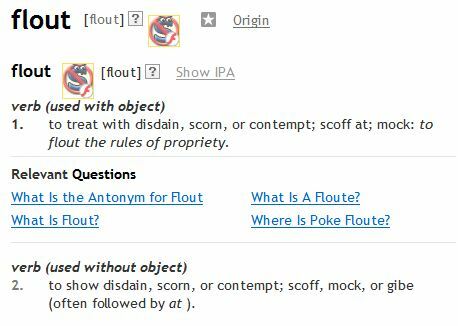 I was going to post about how annoying it is to see “flout” and “flaunt” used interchangeably, when they don’t even mean the same thing. Really, dictionary.com? He was expelled for showing off military regulations? Somehow I doubt that. its shade protects all living things. Say then! Why would you cut it down? I use powdered garlic and ginger, just because that’s what I have on hand at the moment, so my instructions will be given accordingly. 2. In a small bowl or cup, combine garlic, ginger, salt and pepper. Blend well. Make a generous amount, but go easy on the salt. 3. Cover the bottom of the baking dish with a layer of the seasoning mix. 4. Rinse the game hen well under running water, inside and out. Be sure to wash the creases underneath the wings and thighs. 5. Holding game hen upside down, pour some of the seasoning mix into the body cavity. 6. Place game hen chest-down into the baking dish. 7. Sprinkle the rest of the seasoning mix onto the game hen’s back. 8. Place lid on baking dish. If you use foil, make sure the edges are tightly crimped so moisture can’t escape. This method results in a fully-cooked, yet tender and juicy bird with a bit of savory, not-too-salty “soup” in the bottom of the baking dish. The breast meat isn’t dry at all. That’s why I choose a baking dish the bird fits into *exactly* – the dish size plus the tight lid prevent evaporation. I haven’t tried it yet with a regular chicken, because a game hen is just the right size to feed me and give the kitties a meaty little treat when I’m done – everything gets eaten in one sitting. By most standards, I’m not a good cook. I can cook well enough for myself, but I’m no good at adjusting for the varied tastes of other people. My own tastes are simple, so I cook what I cook, and if you don’t like it, you don’t eat it. I’m also no good at delicate, complicated cooking procedures, so I leave that kind of thing to those who enjoy spending the whole day in the kitchen tweaking ingredients. That’s why hubby does his own cooking, and I do mine. He likes super-spicy grilled food anyway, so it all works out.